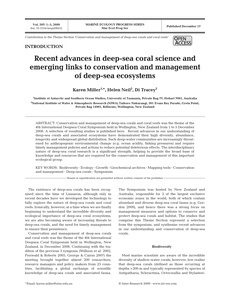 Conservation and management of deep-sea corals and coral reefs was the theme of the 4th International Deepsea Coral Symposium held in Wellington, New Zealand from 1 to 5 December 2008. A selection of resulting studies is published here. Recent advances in our understanding of deep-sea corals and associated ecosystems have demonstrated their high diversity, abundance, longevity and widespread global distribution. Such deep-water communities are increasingly threatened by anthropogenic environmental change (e.g. ocean acidity, fishing pressures) and require timely management policies and actions to reduce potential deleterious effects. The interdisciplinary nature of deep-sea coral research is a significant strength, helping to provide the broad base of knowledge and resources that are required for the conservation and management of this important ecological group.